Two years ago, Oakland's powerful Machine Head released their sixth album, 'The Blackening', to a hailstorm of acclaim and Top 20 placings across Europe as well as reaching 53 on the Billboard Top 200. Comparisons to early Metallica and Rush, critics fell over themselves to appraise it. 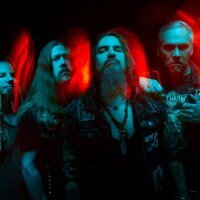 Two months ago, Machine Head announced a UK tour for early 2010 to support that very album for the last time before they adjourn to the studio to carry on with the next album recording sessions. Now they have added some more dates that will include support from Hatebreed, Bleeding Through and All Shall Perish (as with the rest of the tour). The complete list of dates will still start with Plymouth at the city's Pavillions on February 16th and now continue to Newport's Centre (New - 17th), Brixton's Academy (18th), Birmingham's O2 Academy (21st), Leeds Academy (New - 22nd), Glasgow's Academy - I'm seeing a pattern here - (23rd), Newcastle's Academy (New - 25th), Manchester's Apollo (26th), Dublin's Olympia (New - 28th) and now ending in Belfast at George's Market on March 1st. Tickets will go on sale for the new dates from Friday 27th at 9am. Tickets for the pre-existing gigs are still available but selling pretty damn fast. All will cost between £25 and £27.50 (depending on venue) plus fee.